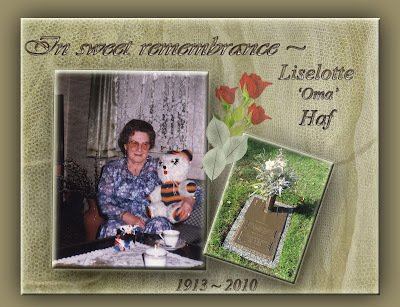 One year ago today, my maternal grandmother, Liselotte 'Oma' Haf, passed away peacefully in her assisted living home, in Augsburg, Germany. Rest in peace . . . Schalf Gut . . . Schlaf in himmlischer Ruh . . . we miss and love you very much, Oma. Beautifully done! Hugs and love today in memory of your grandmother, Oma. Thank you, Cheryl and Gen Story Girl...missing both Oma and my mom very much. What a kind and loving face she has... this is a beautiful way to remember her. One in a long line of beautiful tributes. Thank you, Kathy and Karen. She was a very loving Oma, and I have so many fond and special memories of her that will live on here and in my heart.